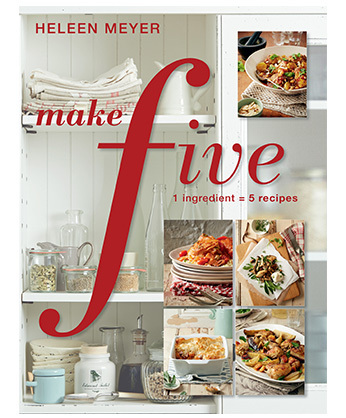 Take one everyday, easily available ingredient and turn it into five exciting new dishes – that’s what Make five is all about. Neem een alledaagse, algemeen beskikbare bestanddeel en skep vyf opwindende nuwe disse – dis waaroor Maak vyf gaan. 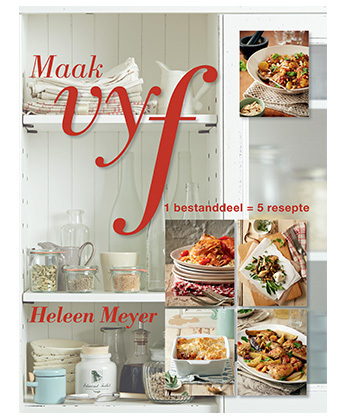 Maak vyf is ongelukkig nie meer in druk nie. Bestel gerus die Engelse kopie: Make five in die bestelvorm hier onder. 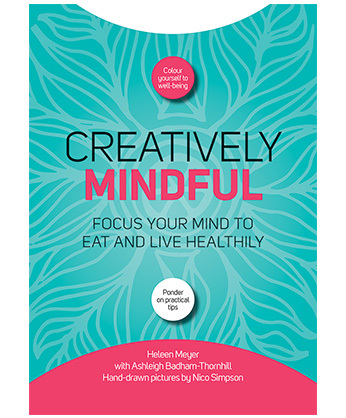 Creatively mindful is a lifestyle guide with a difference. Combine colouring in and food thoughts to inspire a healthier lifestyle. 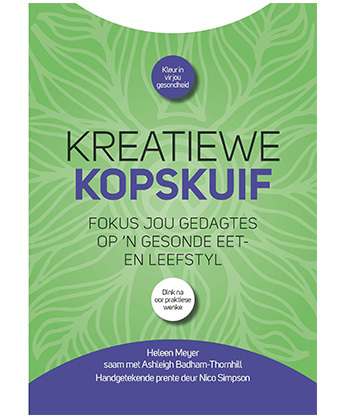 Ook beskikbaar in Afrikaans as Kreatiewe kopskuif. Kreatiewe kopskuif is ‘n leefstylgids met ‘n verskil. Kombineer inkleur met kos gedagtes om jou te inspireer om gesond te leef. Also available in English as Creatively Mindful. 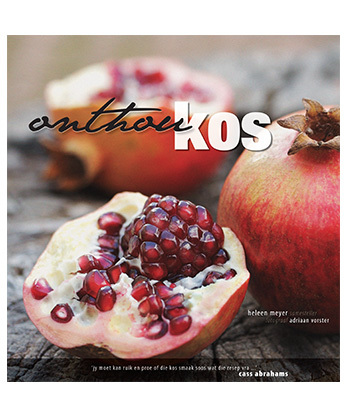 Onthoukos is ‘n internasionaal bekroonde resepteboek wat ‘n versameling van outentieke geregte van regoor Suid-Afrika insluit. Also available in English as Food from the heart. 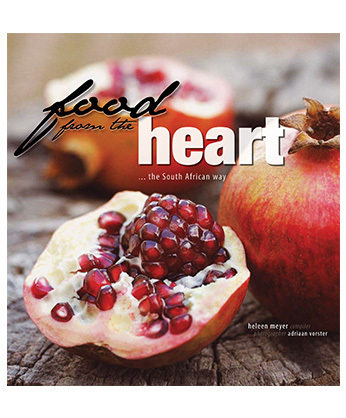 Food from the heart is an international award-winning recipe book featuring a collection of authentic dishes from all over South Africa. Ook beskikbaar in Afrikaans as Onthoukos. Kos is op die tafel! Kos is op die tafel! 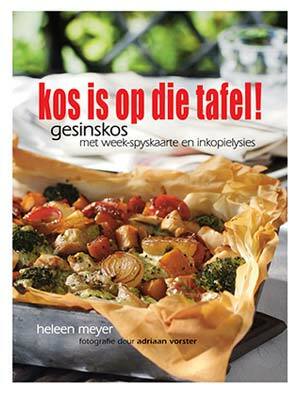 has been recognised as the South African winner of the international Gourmand World Cookbook Awards 2009. The recipes are a combination of firm favourites and those frequently requested by family and friends. The majority of the recipes are easy, quick and honest food for sharing with loved ones. Beside the more than 150 recipes, the book also offers advice on planning a family’s weekly menu and shopping. The recipes, menus and shopping lists all takes the frustration out of knowing what to cook and how. Each recipe also has an indication of the level of difficulty, preparation time, whether it is a vegetarian dish and also whether it is suitable for children. Kos is op die tafel! is unfortunately out of print. A joint initiative by Pharma Dynamics and The Heart and Stroke Foundation of South Africa to bring to life the Cooking from the heart recipe book series in an attempt to show South Africans that eating healthily doesn’t have to be boring, bland or expensive.